Because this year's NBA All-Star Game is in Houston and because Houston is home to the Mission Control Center (and because Nike loves to have an excuse to make special edition sneakers), Nike is designing shoes that look like they're from outer space. They'd look great on aliens. But the shoes will be worn by the best basketball players in the world: LeBron James, Kobe Bryant and Kevin Durant. 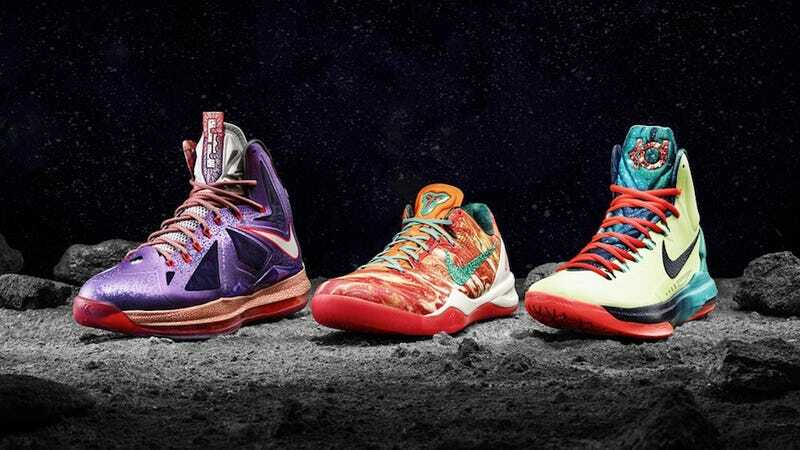 The idea behind the design was to create planets for each player and design their shoes to represent those planets. The Lebron X was made to look like a volcanic surface, the Kobe 8 System is supposed to be some sort of volatile burning ice and the KD V represents dark matter (though I personally think the KD V looks more like green Martian boots). Nike Sportswear is also making an 'Area 72' series for its casual shoes. The Nike Blazer Mid, Nike Vandal, Nike Lunar Force 1, Nike Barkley Posite Max and Nike Air Force Max 2013 will all get some extraterrestrial galaxy design that GLOW IN THE DARK. If you're a sneakerhead, you'll notice the Raygun character on all the NSW shoes too. All the shoe designs are a little loud but I guess that's what you get when you design stuff that's not from our world.